Locked away in the secluded high country of the New South Wales Upper Hunter Valley lies the beautiful Ellerston estate, a veritable Shangri-la preserved for the exclusive enjoyment of one of Australia’s wealthiest families. For lovers of the Equine pursuits, the estate has long been a landmark, for within its natural valleys and tumbling hills are pristine polo fields acknowledged as among the finest in the world. The decision to add golf to the property came during 1999, when the late Kerry Packer propositioned Greg Norman and instructed his company to build him Australia’s toughest, and most spectacular, inland golf course. With budget unlikely to be a problem, the critical issue for designers Norman and Bob Harrison became selecting the best site. 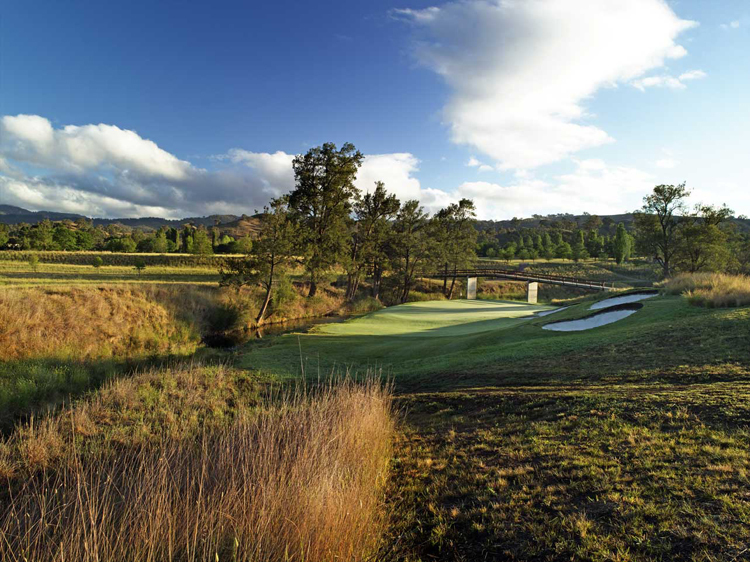 The team was given carte blanche to use any part of Packer’s 70,000-acre sanctuary for their course. 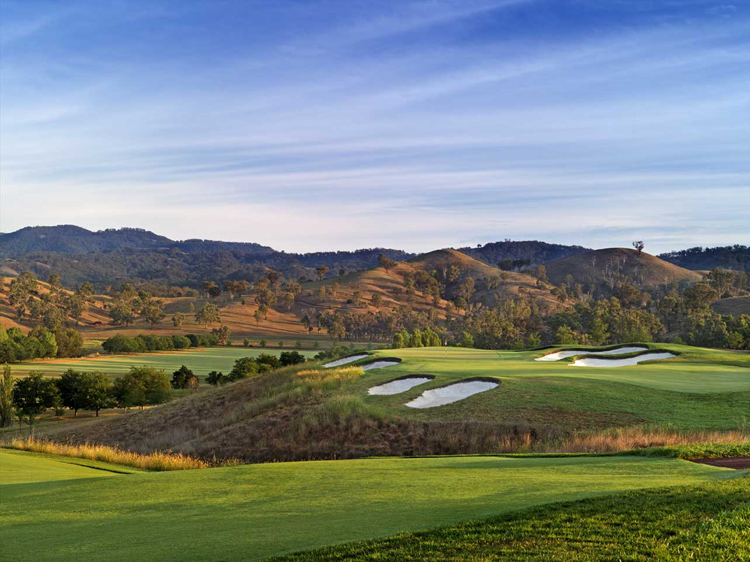 Following several days scouring the vast area, the fast-flowing Pages Creek was discovered and instantly recognized as the perfect location to build the dramatic course that Mr. Packer desired. 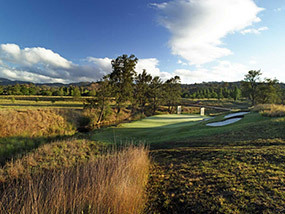 The creek is the central feature of the layout and incorporated into no less than nine holes, with most of the remaining holes built in the higher country leading away from the hazard. Fanatical about the difficulty level, the client’s determination to provide the ultimate challenge to the world’s best players enabled the designers to take more risks than usual. They created shots and sequences that simply wouldn’t work on a more accessible course and built a number of severe green sites pressed hard against the edge of the rapidly running creek. One such site, the 6th, was actually washed away by heavy rains shortly after the course opened. This had not been entirely unexpected given the areas propensity to flood, so in order to alleviate the worry and expense of continually rebuilding the green an elevated alternative was suggested. Without hesitation, however, Packer ordered the green be rebuilt exactly where it was and instructed his design team to do so each time that it washed away. Aside from experiencing its exclusivity, the highlight of Ellerston is the demanding longer holes, which are a relentless driving examination. Each requires a long bomb positioned in the premium part of the fairway to ensure an unimpeded line into the greens. 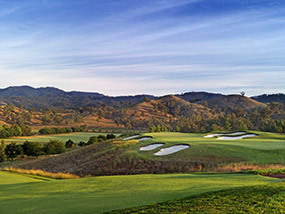 Eight of the par fours measure between 430 and 460 yards, yet as a set they are remarkably diverse thanks to the use of contrasting hazards and the constant elevation change. The 7th and 8th are wonderful illustrations with the downhill 7th measuring 50 yards longer than the 8th but often playing shorter. With an intimidating tee built into the side of a hill, the drive is played along the creek toward a fairway some 200 yards away. The 8th then tracks back up the hill with its approach crossing a nasty gorge and heading toward a green perched on a perilous ledge. Equally impressive are the back-to-back par fives at 9 and 10, the 9th featuring a risk/reward drive across a series of diagonal bunkers followed by a steep downhill plunge through a narrow forest and the 10th meandering along a gully to a gorgeous green pitched beyond the stream. Most memorable of all, though, is the 16th, an audacious right-angle dogleg with its approach an all-or-nothing carry up the length of the creek. The target here is framed by a sheer cliff face and encircled by the creek’s running water. 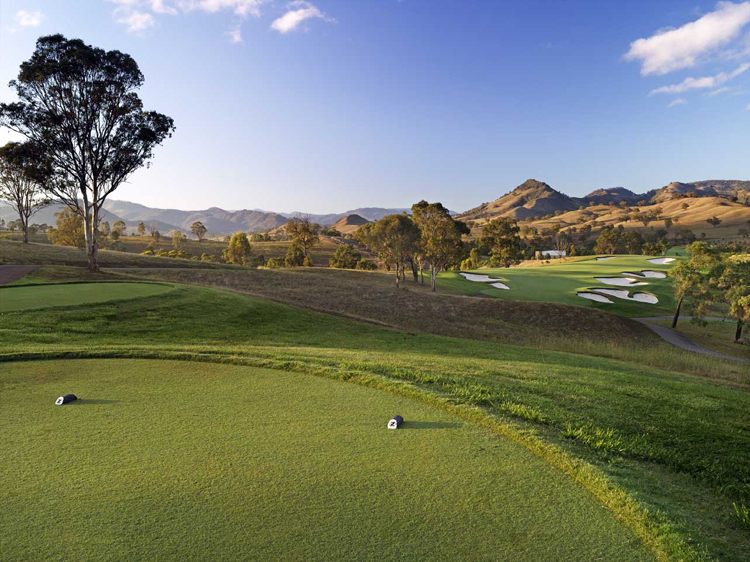 Throughout the round the variety and beauty of the green settings, whether dramatically pushed up against the hazard or set in natural gullies or atop small ridges, is quite striking. Most are framed visually by the impressive Norman/Harrison bunker shapes, although bunkerless targets like the 5th, 10th and 16th are also attractive. The bentgrass putting surfaces, which were designed for great speeds, are immense and without blemish. Likewise the fairway presentation is impossible to fault. The buffalo short roughs provide a contrasting color and texture to the pure couch playing corridors. 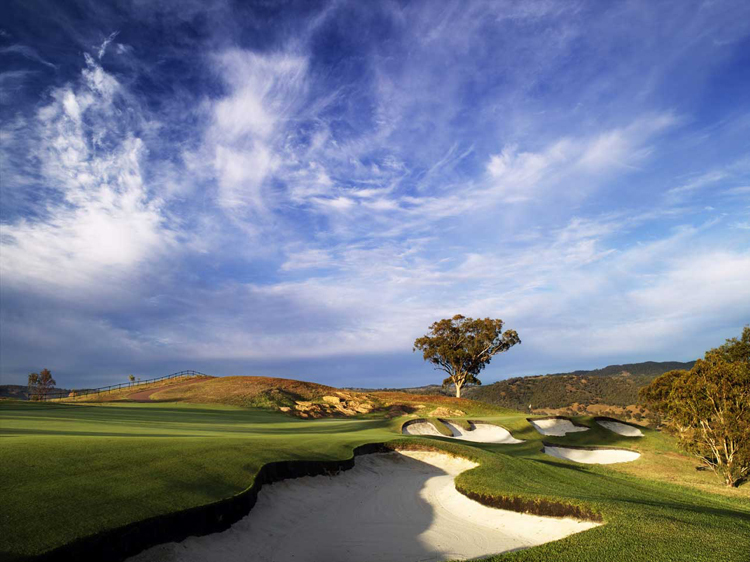 Much more than just great grass however, Ellerston has some wonderful holes and is one of the more fascinating modern courses built in Australia. It isn’t easily walkable and the routing was unapologetically dramatic at the expense of flow and playability, but few fortunate enough to get through the gates here will be concerned by such matters. Indeed, the vast majority who play the course are friends of the Packer family or high-wealth gamblers invited by the Crown Casino group. For the rest of us, a round at Ellerston remains a fantasy, as unobtainable as an invitation to play somewhere like Augusta National.